Ryan Farquhar was a non-qualifier after encountering problems with his SGS/KMR Kawasaki Superbike on his return to the class at the North West 200. Farquhar, who was riding the ZX-10R Superbike for the first time, was at a loss to explain his troubles on Tuesday but hopes to have the issues ironed out ahead of Thursday’s final qualifying session on the north coast. “It’s the first time I’ve ever rode it and I don’t know what’s gone wrong, whether we were running too soft a compound [tyre] or whatever,” said the 39-year-old. Farquhar had better luck in the Supertwins session as he finished second fastest and only 0.065 seconds behind Quattro Plant Kawasaki’s James Hillier. “The Supertwin feels pretty good and I was happy with how I’m riding it, but there will be a lot more to come,” he said. 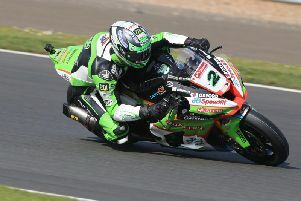 Farquhar only managed three laps on his ZX-10R Superstock machine before pulling in, opting instead to wait until Thursday to push for a fast time after a few moments on the track caused by the strong winds.